We have been hanging out in Kansas City a lot lately. It’s one of the only “vacation destinations” within weekend driving distance. Sure there is always Branson, Lake of the Ozarks, and I guess Chicago if you want to watch the Cardinals beat the Cubs….but there isn’t an abundance of weekend trips around these parts. We make our own fun going on float trips and visiting wineries. These are Missouri folk’s weekend getaways. Our first trip out there seemed like a great idea when we signed up for it….and then a heat wave came. 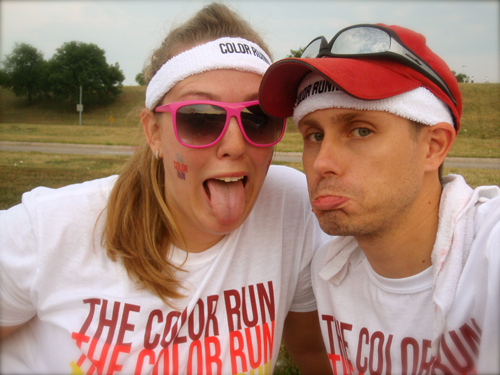 And then running a 5K that we never trained for in the middle of a July heat wave seemed a little insane. Luckily we were four hours from home, so even if people stopped and laughed at us panting on the ground in puddles of sweat….we’d never see them again. Right? This was also a huge step for Tim in overcoming his anxiety. 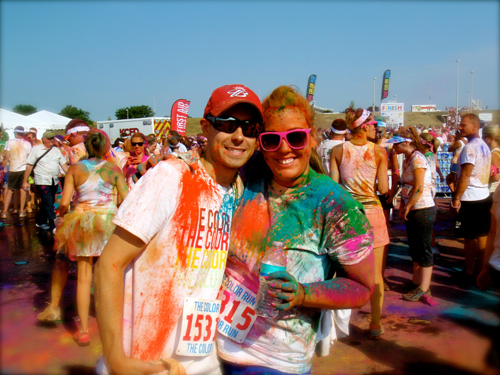 Running in a crowd of 30,000 strangers while people throw colored corn starch at you…yea no problem. 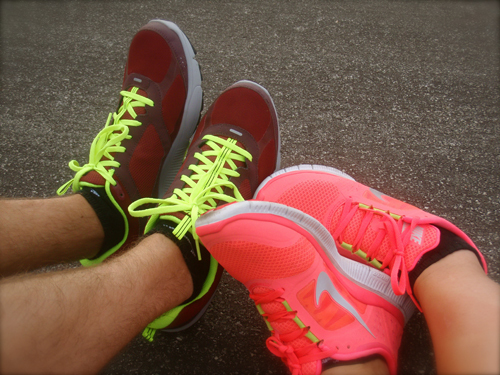 We just focused on the positive, like our sweet new kicks that were supposed to motivate us to run. Not so much. 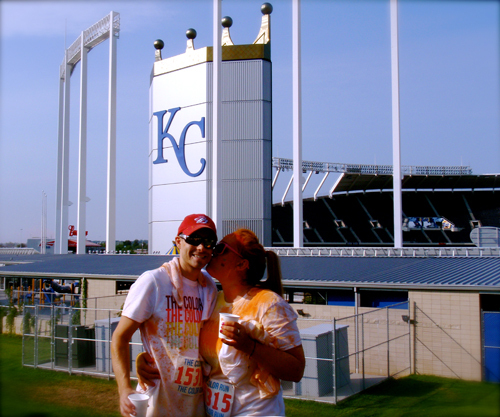 And once we got running….it was just SO. MUCH. FUN. I’m not kidding, like funnest day of our lives….both of our lives. Not just my boytoy agreeing to a crazy harebrained scheme and then telling me it was fun so he can watch baseball. He thought it was fun with a capital F-U-N. Ahem, what anxiety? Then our minds were blown, the running wasn’t the funnest part. An explosion of powdery bright goodness that makes everything in the world seem right. Or it just looks cool and then you realize you are choking on said powder. Details. Now the really crazy part…..we are thinking about doing it again in St. Louis. Maybe we will train this time, sike! When we were “training” for the Color Run by watching videos and peeping pin boards…everyone said that pictures didnt do it justice. They are right. So we made a video. Watch it twice and Enjoy. Omgosh! That looks incredible!! Maybe I’ll come do it with ya next year! Ohhh for sure! It was so much fun!!!! 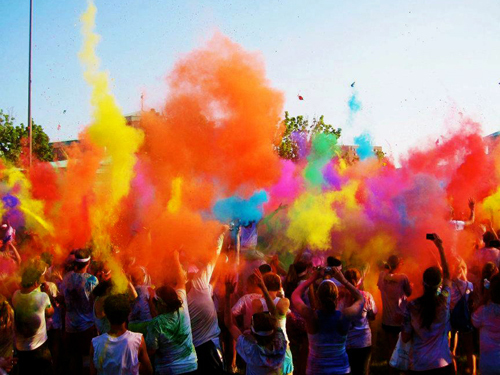 Aaaaaaah I can’t wait to do this! 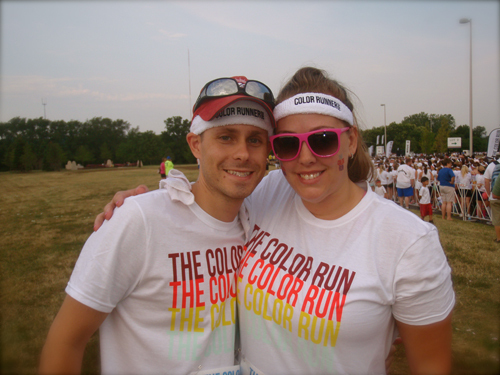 My first 5K will be The Color Run on March 2nd! I’m soooo excited!